Amazon has opened a second location for its radical Amazon Go concept store. The store, the second in Amazon's hometown of Seattle, will be a mile away from the original location near the Seattle Central Library at 920 Fifth Ave., and opened at 7 a.m. today. The new store is slightly smaller than the original, at 1,450 square feet, and won't sell alcohol or staples like milk and bread. It also forgoes an in store kitchen, and will have its fresh food supplied by an Amazon kitchen facility in Seattle. Gianna Puerini, the Amazon vice president who oversees Go, told the Seattle Times she expects a higher portion of office workers among the clientele compared to the first store. 'The population here is a little different,' Puerini said. 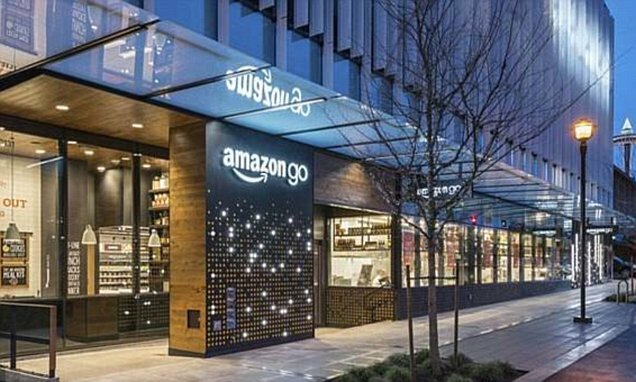 The first store debuted one mile away at the base of Amazon's Day One tower in January, after more than a year of fine-tuning the concept. Amazon customers scan their smartphones at a turnstile to enter the shop. Cameras and sensors identify which products customers remove from the shelves and put into their backpack, or shopping trolley. Since the system is tracking their purchases as they move around the store, customers simply leave when they're finished shopping, with Amazon billing the credit cards on file for any products its cameras identified. Amazon Go, which is also set to open stores in Chicago and San Francisco, has sent rivals scrambling to prepare for yet another disruption from the online retailer. It comes after claims Microsoft is working on technology that would eliminate the need for cashiers and checkout lines in supermarkets. Other rival stores have purportedly tested programs where customers scan and bag each item as they shop, with mixed results.